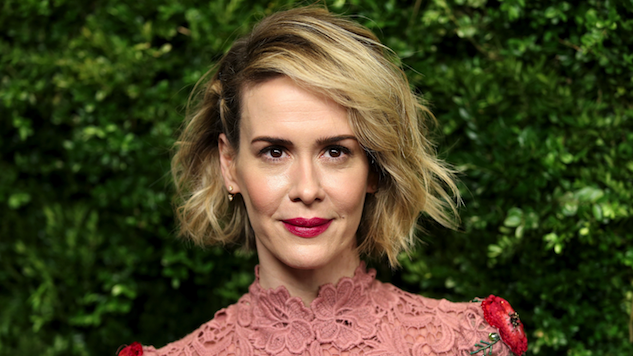 Actress Sarah Paulson has revealed to THR that she’d like to play Donald Trump in the forthcoming seventh season of American Horror Story, which will be based on the 2016 presidential election. Paulson said the role would be “an acting challenge to be sure,” and added that prosthetics would probably be involved—seeing as Paulson looks absolutely nothing like the orange horror clown, we would assume as much. Paulson has starred in many Ryan Murphy creations, including The People v. O.J. Simpson: American Crime Story, for which she won an Emmy last year for her portrayal of Marcia Clark. She has also appeared in all six seasons of AHS thus far, but the forthcoming season of AHS will be a bit different, seeing as it’s focused on such a recent event. Even though the season will be about the election and Paulson has offered (perhaps jokingly) to play Trump, it is still uncertain as to whether the two presidential candidates will even appear in the season. In a previous interview with THR, Murphy said Clinton and Trump would “maybe” appear, and they would have relatively small roles. That’s just as well—we aren’t really interested in watching a bunch of debate remakes, anyway. As Murphy said, the season should focus on the people most negatively affected by the current administration. The 2016 election certainly was an “American horror story,” alright. But in light of all the recent investigations into the Trump administration’s ties to Russia, perhaps the subject would have been better suited for The Election: American Crime Story. Just sayin’.